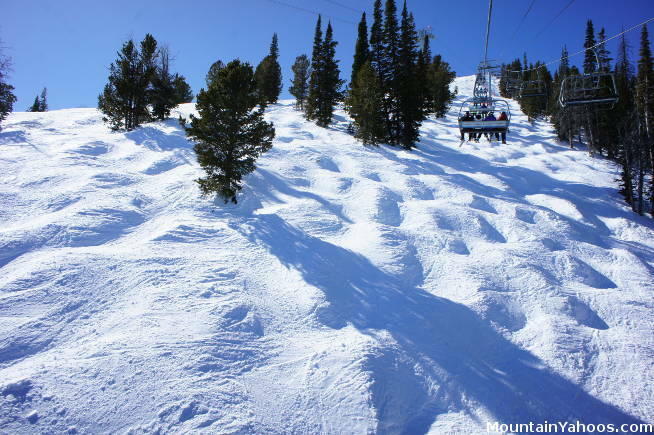 Jackson Hole Ski Resort in Wyoming is a hub for good intermediate skiers and advanced skiers who want to push their limits. Half the terrain is categorized as advanced. The upper terrain is above the tree line and has bowls, ridges, cliffs, couloirs and for some, a groomed run down. Lower on the mountain (below the tree line), the runs are more traditional where you will find a blend of blue and black diamond runs. Jackson Hole and the local town of Teton Village WY is a short 20 minute drive (or half hour bus ride) from the town of Jackson. 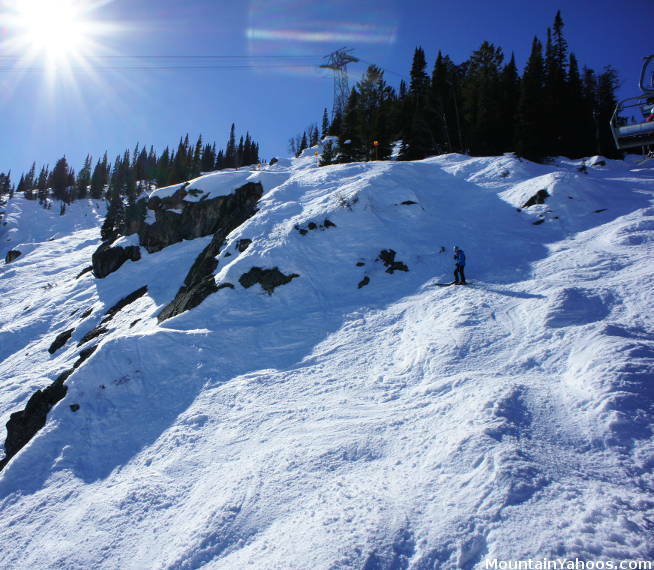 Teton village offers lodging, food and skier amenities. The town of Jackson is larger and has the character and ambiance of a western town and nudges up to the lesser known ski resort of Snow King. 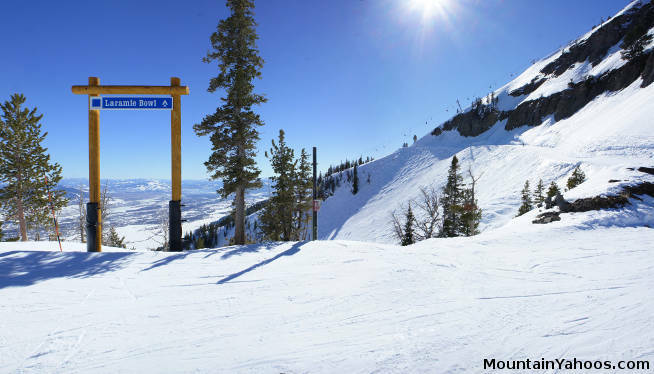 The cat-tracks and trails connecting various areas on the mountain are traditionally "green" rated runs at most ski resorts, but not at Jackson Hole where they are rated as "blue" runs. The beginner will be limited to one or two lifts on the lower part of the mountain (Teewinot Quad Chair and perhaps Apres Vous lift for the more advanced beginner). Intermediate "blue" runs make up 40% of the connecting trails and ski runs. They also provide for an alternative easy way down from mountain peaks which also host the advanced black runs. 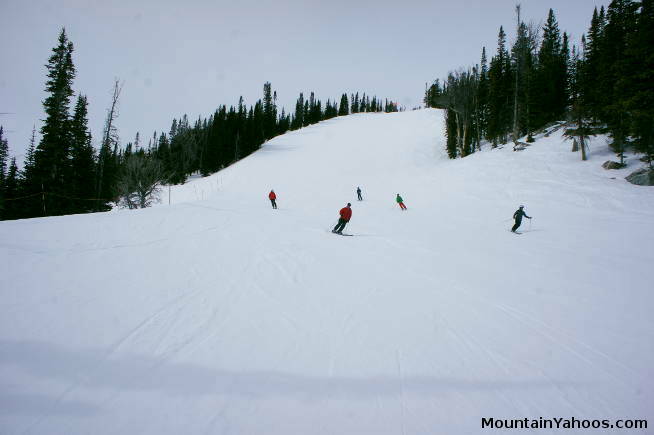 It is quite typical at most resorts that blue runs lack the variety, beauty and excitement of the more advanced black diamond runs. Laramie Bowl debunks this. 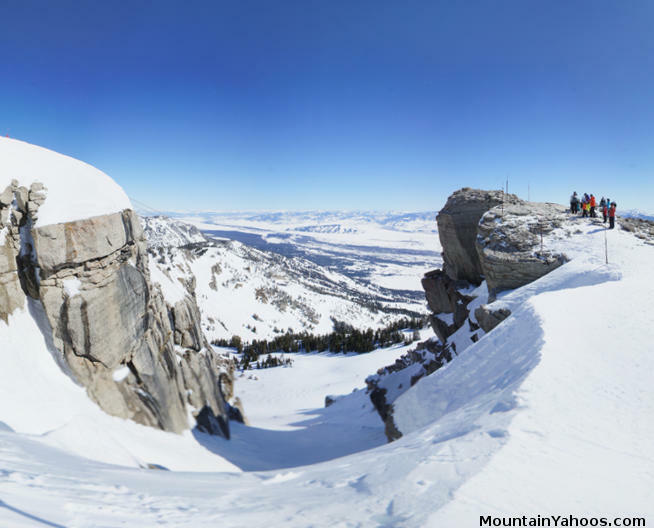 Also see out our spherical panoramic shot of Laramie Bowl. 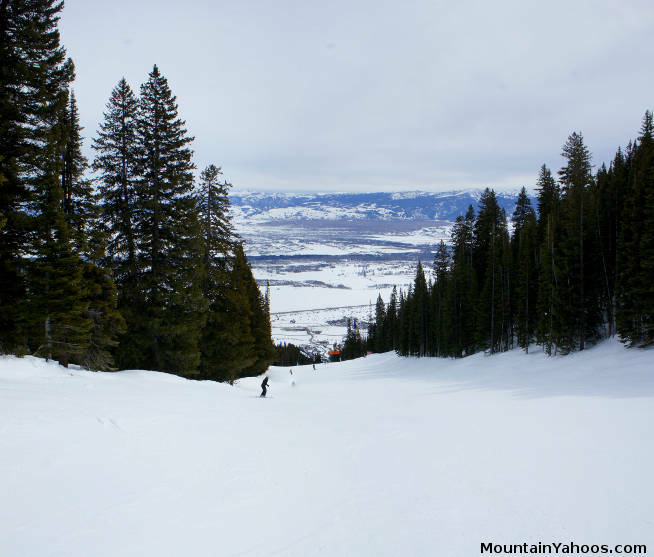 Jackson Hole is famous for its advanced terrain and the reason so many travel to this remote resort. None is more famous than Corbet's Couloir, a narrow chute with a nasty drop for an entrance. It's worth checking out even if you don't ski it as it is a spectacle and you may catch someone with enough skill to ski it rather than the more commonly performed survival slide of fear. 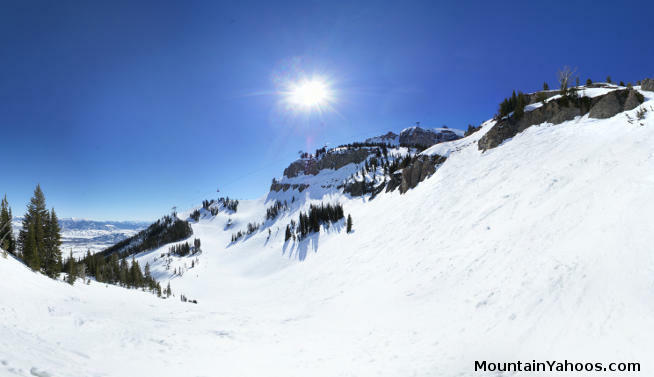 See our article on Jackson Hole's Corbet's Couloir. The chutes and huckable cliffs are often Jackson Hole highlights in extreme ski and snowboard movies but there is also terrain for the rest of us. Note that one should obey the "cliff" and "hazard" warning signs. The ski patrol is trying to keep you out of trouble. For those who like chutes try "Bivouac", "Alta Chutes" and "Tower Three Chutes". Snow coverage is important and the ski patrol will close these runs if they are not safe. 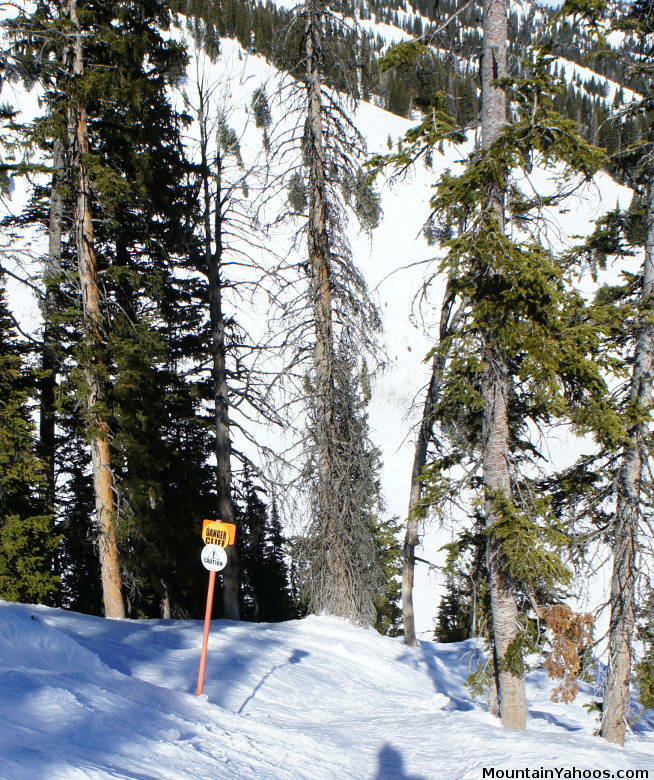 Over by "Alta Chutes" you will also find a tree run called "Pepi's Run". 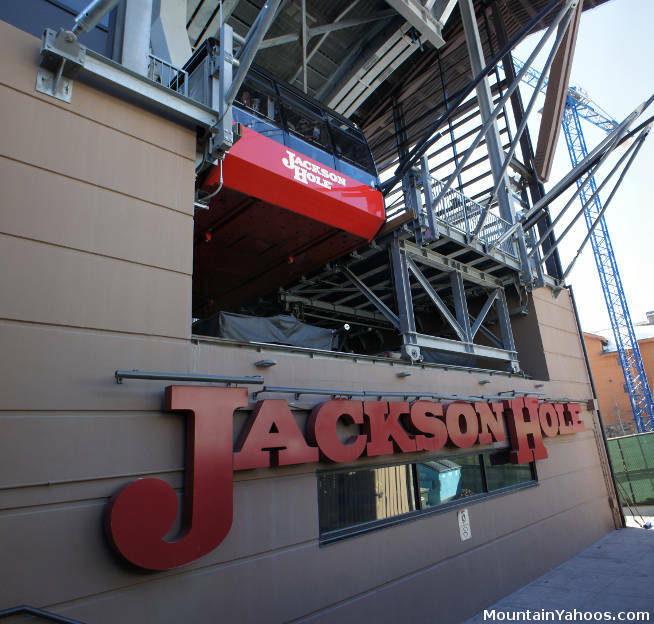 Under Thunder Quad Lift: Best mogul runs at Jackson Hole are under the lifts. Tree coverage at Jackson Hole is not dense especially at the upper elevations which are primarily above the tree line. The most popular tree runs are actually trails cut through the forest rather than a gladed run through the trees. Obey the "Closed" and "Cliff" signs when present. 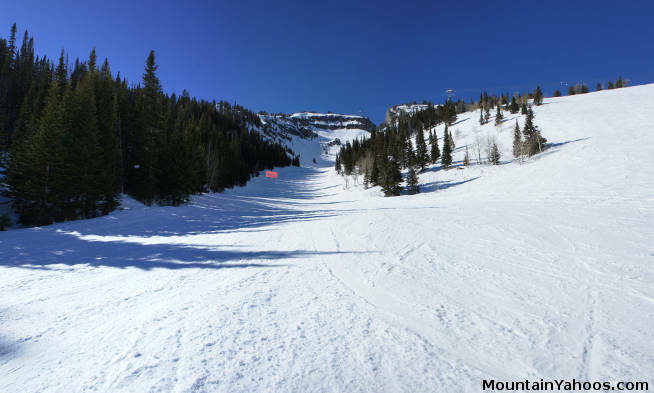 The upper part of Headwall and Casper Bowl are only accessible by hiking to the top of it. The terrain is very advanced with technical chutes and cliffs, the kind of terrain you will find in extreme skiing and snow boarding movies. Beware of overconfidence one may get by following someone's as it may not be an indication of ski-able terrain. 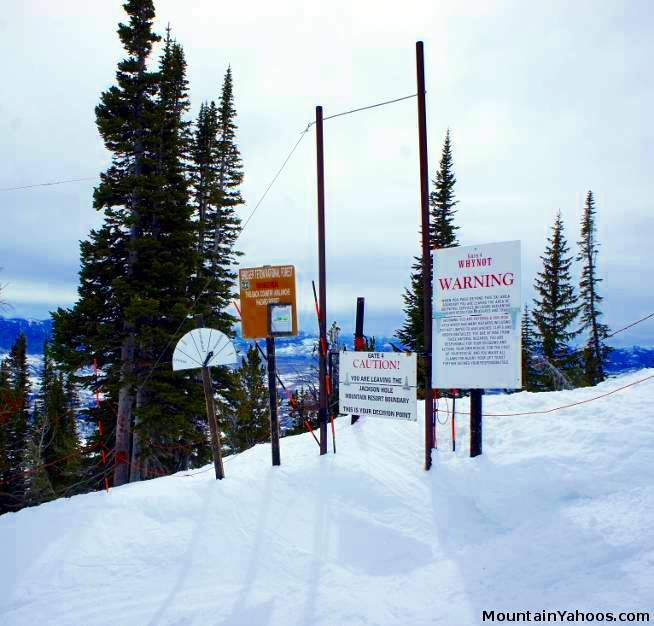 Gates to out of bounds terrain are marked with warning signs about the dangers of avalanches and of no ski patrol services. Boundary gates are shown on the trail map. Bring the proper gear and do not ski out of bounds alone. Out of bounds gate include plenty of warning signs - read them. They are marked on the trail map with the "Stash" icon. 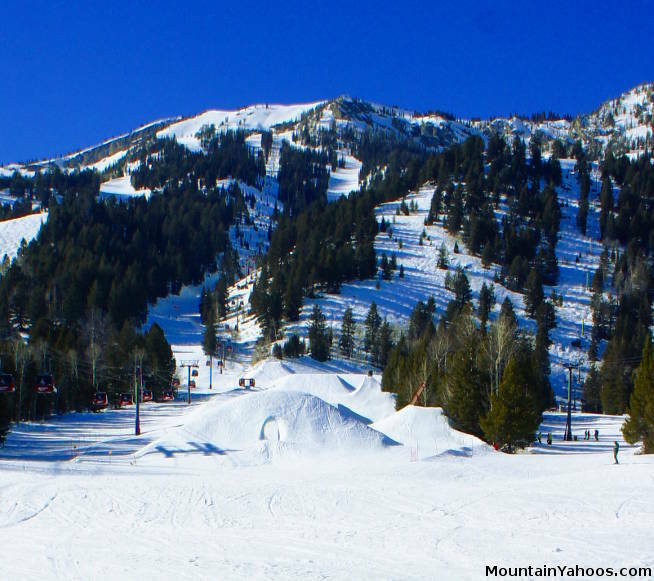 Jackson Hole ski resort and Teton Village is about twenty minutes from the town of Jackson Wyoming. The panoramic tour below shows the mountain base facilities which include a few places to eat, lodging, T-shirt shopping, ski equipment and clothing stores for both purchase and rental. Teton Village surrounds the base with more lodging and a few more services. The town of Jackson WY offers more places to eat, more lodging and a wider shopping venue. 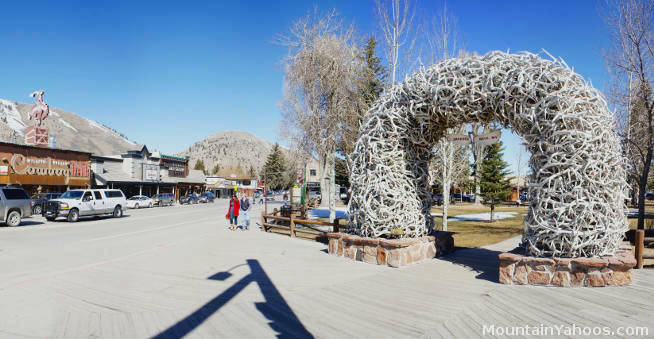 The pulse of the two are quite different with Teton Village having a solid ski persona while the town of Jackson has a blend of a western ranching town and tourist center motif. The town of Jackson offers many shops for gifts and crafts developed by artisans as well as the more typical tourist purchases of T-shirts. If you are in pursuit of mountaineering gear, sporting equipment and technical supplies, try the local town of Wilson. The town of Jackson Wyoming. Antlers shed by elk were used to create the arch. The ski resort view-able from the town of Jackson is Snow King Mountain.